Summer here is the opposite of summer in Missouri and Pennsylvania. We grew up where summer was hot and you needed to cool off in a swimming pool. Here that kind of summer is November – February. We have cool (cool for us 66-72 degrees), rainy weather. Summer break from school is long and boring because you’re stuck inside a lot without entertainment options. The other day it was raining somewhat heavy (it wasn’t a tropical downpour) and we heard water coming from the porch area. 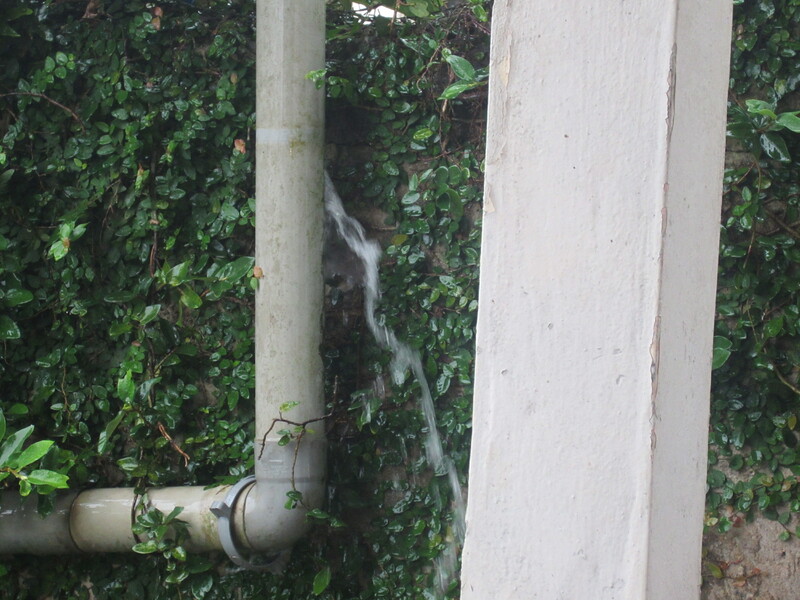 We looked out and discovered our gutter down pipe sprung a leak. This entry was posted in Cameroon, home and tagged gutter, leak, Summer, Vacation. Bookmark the permalink. Have you now become a plumber in addition to all your other jobs? It’s always an adventure, isn’t it?